Butterball is a brand of turkey introduced in 1954 and marketed for its plump, broad breast. While Ben Franklin wasn’t successful at making the turkey the United States' national bird, the turkey has become the traditional Thanksgiving main course. You can cook a turkey many ways, such as smoking, barbecuing or deep-frying it. But roasting is the traditional way to cook a turkey. 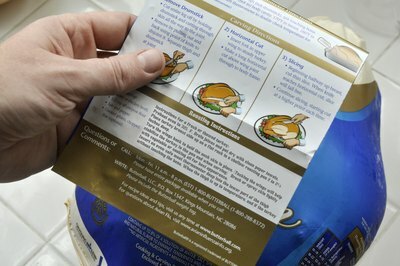 Read the packaging to determine the size of the turkey and recommended cooking time per pound. Cooking times will vary, depending on the size of the turkey. Cooking times for turkeys under 16 pounds are approximately 15 minutes per pound, while larger turkeys take approximately 12 minutes per pound. Remove the thawed turkey from its packaging; discard juices and pat the turkey dry with paper towels. 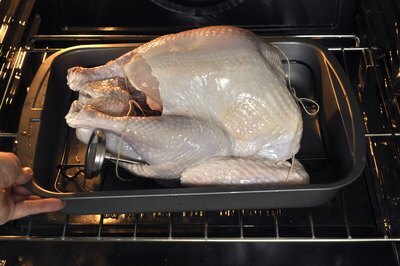 Set a meat rack in a shallow roasting pan, selecting one large enough to hold the turkey. Arrange the turkey lifter across the length of the meat rack. A turkey lifter is a heavy string or cord with a loop on each end. It comes with the turkey, and is used to lift the turkey from the pan after the turkey is cooked. Remove any packets of giblets or loose neck from the turkey’s cavities. 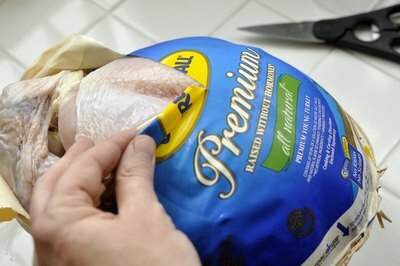 Check both ends of the turkey by sticking your hand inside the bird. Use contents of the packets as gravy or stuffing ingredients. Hold the neck skin securely by tucking the wings back and set the turkey on the turkey lifter, breast side up. Pull one loop of the turkey lifter over the wings and breast, and the other over the turkey’s legs. Don’t rest the loops over the pan while cooking; keep them on the turkey. Brush the entire turkey with vegetable oil using a pastry brush. 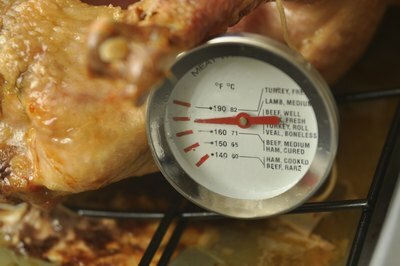 Insert a meat thermometer into the lower section of the thigh muscle without touching the bone. 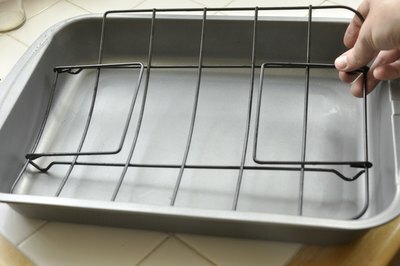 Set the roasting pan in the center of the preheated oven. 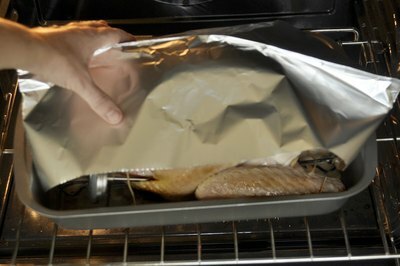 Make a tent out of a sheet of aluminum foil, and loosely cover the turkey to prevent over-browning. 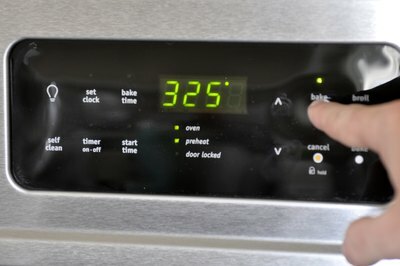 Do this during the last third of the cooking time. 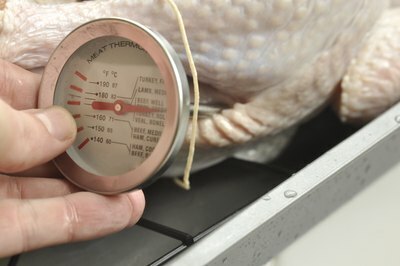 Remove the turkey from the oven when the meat thermometer reaches 180 degrees. Lift the turkey from the roasting pan using the loops from the turkey lifter as handles; set it on a platter. Allow the turkey to set for 15 minutes prior to carving. Discard the turkey lifter. Always sanitize your work station before and after working on the turkey. If stuffing a turkey, never do it the night before. Do it immediately before roasting to avoid food poisoning.